If you think the most important meal is breakfast, I am about to disagree. I think most of us received that message and are applying it. If breakfast is the meal that sets us up for a successful day, then how are your afternoon choices setting you up for a successful evening? And by success I mean taking care of your body ina wonderful say: fueling it when it’s empty, resting when it’s tired, moving it when it’s stiff, strengthening it when it’s weak, tuning in to think wisely when life gets busy. Most clients, myself included, admit that they do really well all day but have trouble eating from -2/+2 during the evenings as well as focusing on eating Fuel Food during that time. Why? When I get down to the nitty-gritty and the Journal reveals it’s truth: the evenings can be doomed to failure because of afternoon choices. I hear you out there, “But Diana……..
……I have meetings back to back, I can’t stop. 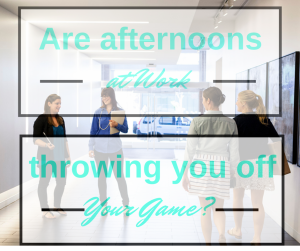 …..If I don’t stay focused in the afternoon, I’ll never get out of the office in time. What is it for you? What will it take for you to tune into your needs during the afternoon? 1) Identify the Issue for you. What is ONE area where you feel out of control or aren’t taking care of yourself in the evening? Clue, I wish I could_______________in the evening. 2) What is one step in the afternoon that could support that wish/desire/plan. 3) Watch, does it work? If YES, then in corporate it into your life. If NO, try another plan. Without judgment, with kindness. 1) I wish I didn’t overeat at night. 2) I can keep carrots and hummus at work for an afternoon snack. 3) That satisfies me, I’m much calmer about getting dinner on the table and I don’t snack on non-fuel foods when I walk in the door. 1) I wish I didn’t feel so exhausted at night. 2) I could take a break at 4 pm, pause and decide what absolutely needs to get done at work. I could close my eyes and get grounded for just a minute or 2. 3) I tried closing my eyes, too wound up to relax. I tried a brisk walk and it cleared my head and helped me to prioritize the close of my work day as well as my plans for the evening. Let me know what works for you. What did you try, where are you stuck? Reply here or join me on our Closed Facebook Group where I’ve started a discussion. Click Here and ask to join. Would love to see you there!! Not on my list? Wanna Be? Click Here.